There is a celebration today at the Port of Vancouver, Washington for the completion of the Columbia River Channel Improvements Project. The project deepened the navigation channel from 40 to 43 feet between the Pacific Ocean and Portland/Vancouver to accommodate more northwest cargo on the larger, fuel-efficient ships that dominate the world shipping fleet. Dave Hunt, Executive Director of the Channel Deepening Coalition, says the 200-million dollar project was the result of an amazing collaborative effort. Hunt: "Twenty years ago there lots of disparate voices in favor of this project and infrastructure investment in the lower Columbia River. But over the last 20 years people have really come together across state lines. Across party lines, across ag, labor, business, port lines, in order to find common ground in supporting the infrastructure investment. State funding came through nine years ago. The federal funding has come through gradually over the last ten years and now we have a project that is ready to open up." Hunt says there have already been benefits. Hunt: "Absolutely. If you look at just the Port of Longview which has just put in a 200-million dollar grain export facility, the first grain export facility in the entire U.S. in 25 years. That's only come here because they knew we were going to have a deeper Columbia River channel. 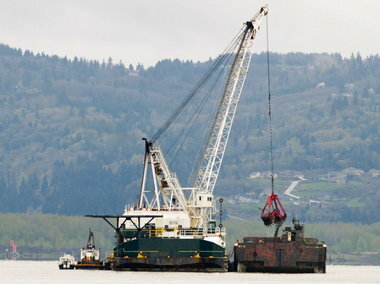 Similar investments at the Port of Kalama, Port of St. Helens, at the Port of Vancouver, at the Port of Portland." The channel deepening covered 103 miles. Elected Officials Celebrate Completion of Columbia River Dredging Project <-- Listen at original site.